It would be a stretch for me to try to connect the U.S. election to beauty, or personal appearance, or anything truly germane to my focus here. There's plenty of research out there about height advantage in presidential elections, and how candidates' facial looks don't matter as much as we might think—which is better for democracy and a fair vote, given that Mitt Romney's "high-quality face" is apparently in the 99th percentile of attractiveness, making him, as Zoolander might say, really really goodlooking. (Presumably Obama is too familiar for study respondents to accurately rate his face, though that hasn't stopped us for, say, George Clooney, so.) But really, so much of the research is contradictory and can be spun in pretty much any way you'd like—and, I mean, we're talking about two conventionally attractive candidates here, not JFK and Nixon, knowwhatimean? Granted, they both also ran over Jim Lehrer in the first debate, which probably set the stage for the following go-rounds, so it's not just that they sit up and obey for the distinguished white man while trampling all over the ladies. But given the disregard for the rules displayed in every debate until last night, I don't think the candidates reined it in just to tone down the levels of rabidity. 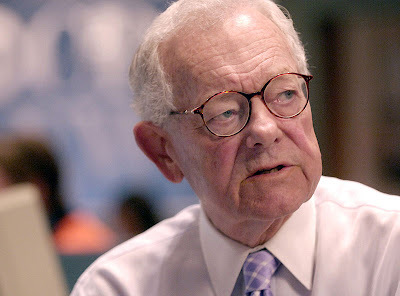 I watched them both essentially obey Schieffer, and then I looked at Schieffer—his grandfatherly eyes, his dignified manner, his tone that commanded respect. I contrasted it with the way they appeared to regard Crowley in the town hall debate, and then I looked at her. And at this point, I realize that this does have to do with looks, at least a bit, for I went back and watched part of the town hall debate to accurately report on what I myself saw in Crowley, and here it is: full, maternal cheeks dotted with bright blush, arched eyebrows, curled hair. That is, I saw the signs of conventional femininity more than I saw a moderator. It pains me to write this—it pains me to think that after a year and a half of arguing here of the desire to reconcile hallmarks of conventional femininity with hallmarks of power, even I still have these thoughts, but there it is: I saw her bouncing hair and wondered how much of an invitation that was to the candidates to talk over her. I'm not blaming Crowley for this, or her hair; I'm blaming...hell, I suppose I'm blaming the centuries that came before us, whispering and yelling and ruling and singing that women—you know, the people who curl their hair and wear ribbons and darken their eyelashes and all that jazz—are better seen and not heard. I had several thoughts last night watching the debate, but only one as definitive as this: Judging from their behavior toward the moderators, both candidates long for a patriarch. That doesn't mean Obama has governed like one, nor does it necessarily mean Romney would. It's not like our political arena has done a stellar job of offering alternatives to patriarchs in leading roles—and judging from my own niggling thoughts about Candy Crowley and her hair, it's not like all of us feminists always do a stellar job of looking elsewhere for leadership either. Maybe right now this is the best we're going to be able to do. That doesn't mean I'm not going to question it. And it certainly doesn't mean I'm not going to question my own complicity in upholding the signals of patriarchy as what I myself unconsciously obey. Hm. I think I noticed a similar dynamic in last night's debate, BUT I will say this for Crowley: she DOES know how to interrupt like a big girl. Heh, absolutely! She conducted herself *more* assertively than Schieffer, I thought, but to less avail. I could certainly take a few lessons from her in that regard. Kids making use of transparent handbags would be too self-conscious to create whatever class banned chanel replica handbags, as they are giong quite simply unearthed and additionally apprehended. Transparent school bags just for class isn't going to utterly terminate delinquency for high schools even if. An example, creative kids can continue to keep hostile elements anywhere between novels or possibly chanel replica bags. Still, all of these handbags you must slow up the driving about undesirable thing to make sure you class, combined with learner wrongdoing. Surely, all the safeguards might earn broad check, with the exception of quickly looking inside the handbags regarding discover about kids. Equally, chanel replica bags sensors and additionally check appliances might specify all the attractiveness about kitchen knives or possibly prints buried throughout every carry-on. Trainers and additionally class worker can easily watch any time kids really are eliminating or possibly robbing educational setting equipment. Robbing class chanel replica handbags isn't really bizarre. Kids may easily receive novels or possibly class equipment, close off individuals with their handbags and additionally pay off class, evading check. Trainers in addition to other sorts of kids can easily watch once you use class elements into your carry-on any time it’s see-through. Surely, believe not likely are brave enough divert just about anything good that men can easily look at valuables on your chanel replica bags. Kids can easily collect elements the ones handbags. It’s really difficult to make sure you rummage on the valuables on your back pack to search for small to medium sized matters, want any notepad or possibly credit card. The things region pack up remarks while you don’t be aware of just where any notepad is normally?